You can make this savory by adding herbs such as paprika, onion powder, garlic powder; or even noncaloric sweetener & cinnamon. You can make this in a rectangular microwave safe dish, or a round container. I've used this sweetened lightly with sweetener & cinnamon as a pancake. Serve with SF pancake syrup. 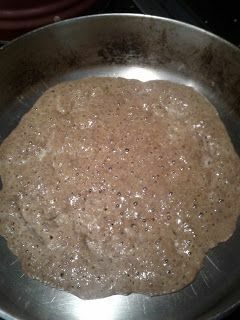 Mix together flax and baking powder. Stir in melted coconut oil. Beat in egg and water until blended. Pour into greased microwave safe pie plate. Microwave on high for 2-3 minutes until cooked. Allow to cool for about 5 minutes. Gently lift an edge with a spatula, loosen from the pan. Flip the wrap over and top with desired toppings. I love this. It's simple and easy. I love hummus and it was hard to find something besides vegetables to eat with it but not any more.